It has never occurred to me to check my grandmothers’ FBI files. They were feisty ladies and one had a distinct political inclination, but I still doubt that either was ever investigated by the Feds. Not so Eve Sicular, a New York-based drummer, who leads the bands Metropolitan Klezmer and Isle of Klezbos. Sicular decided to uncover the story of her own grandmother, Dr. Adele Sicular. Using a combination of family gossip, a variety of archival material and documents obtained under the Freedom of Information Act, Sicular has put together a theater presentation that defies definition. 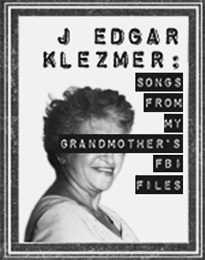 The piece, entitled J. Edgar Klezmer: Songs from My Grandmother’s FBI Files, is a multi-media documentary with music. J. Edgar Klezmer: Songs from My Grandmother’s FBI File was presented in the Kutz Theatre, the black-box facility in the Lackland Center at Centenary College in Hackettstown, Feb. 12 through the 15. Sicular, center-stage at the drums, was joined by Melissa Fogarty and Yelena Shmulenson, who sang and played a variety of characters, and musicians Debra Kreisberg, Reut Regev and Shoko Nagai, who played a total of six instruments among them. Sicular, who bears a startling resemblance to photographs of her grandmother projected onto the backdrop, narrated the story. Fogarty and Shmulenson, in suits, ties and fedoras (but distinctly female) portrayed FBI agents as well as other characters in the story. Grandmother Adele was a physician at a time when a female physician was a rarity. In the course of her career in New York in the 1930s and ‘40s, she became a psychiatrist, ultimately employed in that capacity by the Veterans’ Administration. In 1948, World War II having ended and the Soviet Union taking the role of the great threat to this country, various officials undertook the job of finding Communists and Communist-sympathizers employed in government agencies. Leading the charge was the FBI, under the leadership of J. Edgar Hoover. Was Adele Sicular a Communist? She was active in her community, committing such dastardly acts as organizing a first-aid course for neighborhood residents (under the auspices, by the way, of the American Red Cross). Neighbors were questioned about her. Personal irrelevancies were duly noted. Ultimately she lost her job. The piece makes use of projections of documents ranging from articles from newspapers to brochures to actual FBI reports. Pursuit of those who expressed anti-racist views as well as of homosexuals were high on the list of FBI tactics. It is quite horrifying—but also an amazingly entertaining way to learn history. We were, we admit, waiting for the group to break into a klezmer tune. The bits and pieces were tempting, a tease for the musical climax that never came. The performances were right on target, and the question-and-answer session with the cast that followed it was enjoyable. Plaudits to the Centenary Stage Company for bringing this unusual piece to the stage.